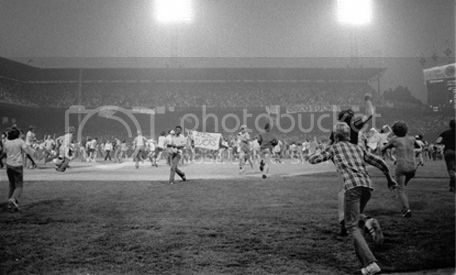 In 1979, thousands of people stormed the field at Comiskey during what became an anti-disco demonstration. White Sox owner Bill Veeck's son, Mike Veeck, organization a promotion along with local anti-disco radio DJ Steve Dahl: bring in an old disco record to burn, and a ticket is only $0.98. Thousands of people showed up with disco records. After the first game of a double header, the records were exploded, and people rushed the field. Eventually, the field was so damaged that the Sox had to forfeit the game.